The Norton team of John McGuinness, Peter Hickman and Davey Todd. John McGuinness will spearhead a three-man factory Norton team at this year’s Isle of Man TT races. The 23-time Mountain Course winner will make his TT return in June after missing the event in 2017 and 2018 due to injuries he sustained in a crash at the North West 200. John McGuinness will make his eagerly awaited Isle of Man TT return this year. McGuinness will be joined by 135mph lap record holder Peter Hickman and last year’s top newcomer Davey Todd, with all three competing on Norton’s new Superlight machine in the Lightweight TT. Morecambe star McGuinness, who won the Classic TT Senior race last August, will also ride the latest specification Norton SG8 in the Superbike and Senior races as the team’s sole representative. The 46-year-old will be making his debut in the Lightweight class and said he was ‘blown away’ by Norton’s new 650cc machine, which has been developed in house. He had been due to compete in the class last year for Northern Ireland’s KMR Kawasaki team. “I’m blown away with the Norton Superlight,” McGuinness said. “It’s a class I’ve never raced in so I’m really excited and want to be winning. Norton owner Stuart Garner is confident the Superlight will be a match for the Kawasaki and Paton machines and is thrilled to have such a strong line-up in place for the TT. 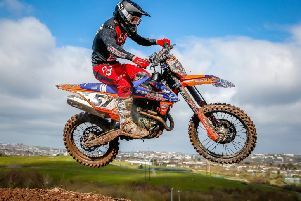 “We believe that we’ve got a very competitive bike for the class and I’m delighted that we’ve been able to secure the best riders as well,” he said. Hickman has competed in the Lightweight class previously and was holding third place last year on Ryan Farquhar’s KMR Kawasaki when he was forced out on the final lap. Rising star Todd will also be making his Lightweight TT bow although the 23-year-old has raced Supertwin machinery before at the Irish national road races plus the Ulster Grand Prix and Southern 100.